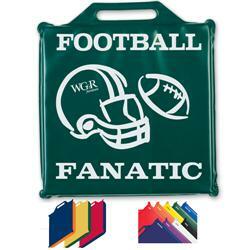 One of our most popular stadium cushions available with a two-tone siding to match your team's colors! 12" x 12" in size and 1" thick with a built in handle. approximately 1" thick, 10 mil vinyl, 2 ply electronic sealing. Large imprint area - print your teams schedule and more! Made in the USA! Can also be done with a regular one color construction. Available Colors: Red, Orange, Yellow, Green, Royal Blue, Navy Blue, Purple, White and Black. Typical Imprint Area(s): 10" x 10"
Stadium Cushion - approximately 1" thick, 10 mil vinyl, 2 ply electronic sealing. Shipped deflated standard, 50 pieces per box. Inflated shipping available, please specify. Can do dual color choices.